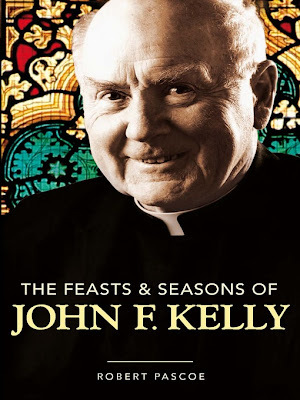 I recently read Robert Pascoe's The Feasts and seasons of John F. Kelly (Allen & Unwin, 2006) as part of my effort to read more books in 2010. John F. (or the Mons as he was later known) was born in Mansfield in 1910 and thus lived through an amazing period of the Catholic Church in Australia. He was an intellectual and book-lover who often at Lent tried to give up going to bookshops (he seems mostly to have failed in this ambition); his name was also synonymous for many years with the Catechism, the Catholic Education Office, with Pre-Cana conferences and with Y.C.W. (Young Christian Workers). His lifetime covered the Second Vatican Council, the Movement, the Labour Party split, and archbishoprics of Mannix, Simmonds, Knox and Little. Whilst ordained in 1928 and having worked as a curate in parishes, his main work was outside parishes until 1968 when he "retired" to become parish priest of Deepdene in the City of Boroondara, where ironically he had as his parishioner, B.A. Santamaria. The Mons was at Deepdene until he really retired to a house he purchased in Inglesby Road, Camberwell in 1986. I had heard of John F Kelly all my life as my introduction to history was through the textbooks he wrote for Victorian Catholic primary schools and a large proportion of his library now adorns the Armadale presbytery where my friend Brendan Hayes presides. I enjoyed reading this book, though at times I was a bit irritated by inaccuracies such as where Pascoe goes on about the Palace Hotel in Camberwell and the affects of Camberwell declaring itself a dry zone. No, Mr Pascoe, the Palace Hotel was only affected by the dry zone by getting an increase in business as the Palace in on the Hawthorn side of Bourke Road!